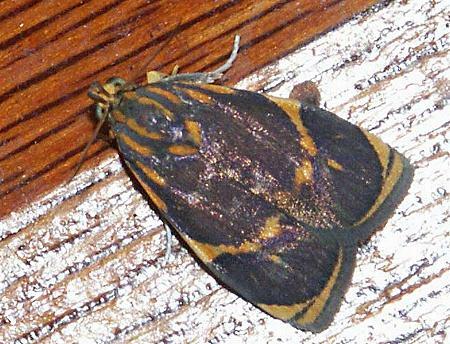 These adult moths have brown forewings each with an irregular orange arc across the middle and an orange margin. The hindwings are transparent, each with a broad black margin and costa. The wingspan is about 1.5 cms. Moths of Australia, Melbourne University Press, 1990, pl. 7.30, p. 312. A Guide to Australian Moths, CSIRO Publishing, 2007, p. 117.